Praying Mantis: Learn about the giant insect predator. The Praying Mantis is a large insect from the order of Mantodea. It's called the "Praying" Mantis because it often stands in a pose that looks like it is praying. There are different types of Praying Mantises. They are often named after different areas of the world (like the Carolina Mantis, the European Mantis, and the Chinese Mantis), but many can be found all over the world. These species will vary in size. For example the Carolina Mantis will grow to about 2 inches long, while the Chinese Praying Mantis can grow to 5 inches long. 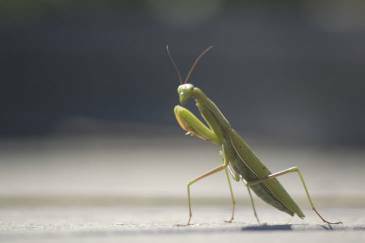 The Praying Mantis has a head, thorax, and abdomen just like all insects. It has large eyes on each side of its head and it can rotate its head 360 degrees. This enables the Praying Mantis to see very well. The Mantis also has two antennae on its head that it uses for navigation. Once fully grown, a Praying Mantis will grow wings and can fly. It has six legs. The back four legs are primarily used for walking, while the front two legs are have sharp spines that help the Praying Mantis capture and hold on to prey. Praying Mantids use camouflage to hide from predators and sneak up on prey. Different species vary in color from dark brown to green. These colors allow them to blend into their natural surroundings such as tree bark or green plant leaves. They also can hold very still to appear part of a leaf or a tree. What do Praying Mantids Eat? The Praying Mantis is a carnivorous insect. This means it lives off of other animals not plants. It mostly lives off of other insects like flies and crickets, but some larger Praying Mantids may occasionally capture and eat a small reptile or bird. Praying Mantids will usually live from spring to fall. The longest a Mantis will live is around 1 year. One of the strangest things about this insect is that the female will often eat the male and siblings will often eat each other. 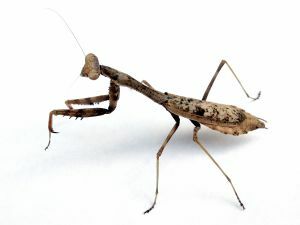 Most species of the Praying Mantis are not endangered and many are kept as pets. They are also good to have in your yard as they will eat other insects. Predators include frogs, rodents, birds, and bats. Although they sit still a lot and look slow, they are extremely fast when they move to attack their prey. There are over 2,000 species of praying mantis. Around 20 species live in North America. When capturing their prey, they typically bite of its head first. This way it will stop moving and can't get away.